Here is the finished "Petunias". 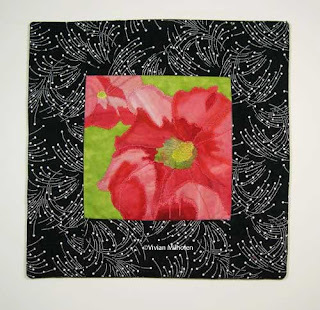 It is all machine appliqued and quilted. This is for the Take It Further Challenge for January. The theme was to use a certain set of colors or someone you admire. I chose my mom as I stated in the previous post below. She loved petunias. Below are two detail shots and of course, as I was photographing it, Taylor decided to jump up on the stool I had the board propped on. She is just too cute. What a ham...seems she loves to get her photo taken. 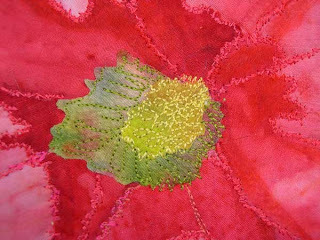 This is a WIP of a quilt I am creating using one of my photos. This is for the challenge...Take It Further. One of the challenge options is to create art that represents someone you admire. The pink petunias represent my mom. She always grew a pot of petunias on her front porch. I still grow a pot of pink petunias to always remind me of her happy attitude no matter what life deals to you. She went through great adversity and suffering and still found things to laugh about. 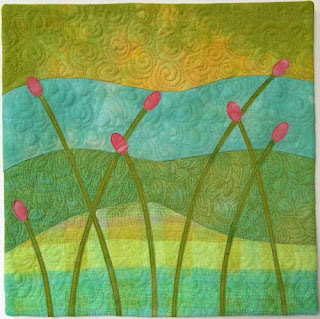 This piece is ready to machine quilt and applique. 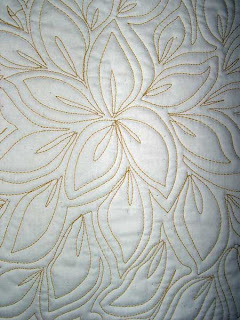 The white lines are the marked lines for quilting. I try to follow the lines I mark, but usually I go by what feels right once I get it under the machine needle. The good news about the lines is that they iron away. I used the Clover White Marking pen. This picture was also a test of my new lighting system using the daylight fluorescent bulbs. I didn't use a flash and shot it rather quickly. But I think it still looks better and the colors are true. I will post more about the details of the lighting system later. 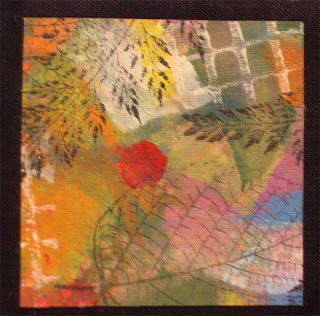 I'm off to machine quilt this piece. I am currently having an artist's block. I don't know what to do today. I could do this: machine quilt. I have several tops that need to be finished. These are a couple of practice pieces that I hang on my design board. 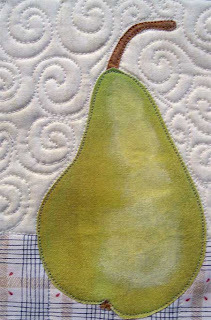 Or I could paint some fabric with Setacolor like I did for the pear below. 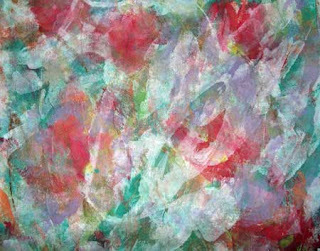 Or I could paint some paper towels and create some paper fabric and make something from it. 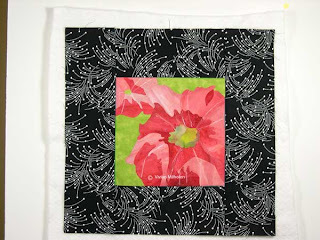 Or I could paint and stamp some ugly fabric so I will use it (like the fabric below.) I found a tub full of old fabric scraps from the 90's when I first started quilting. I can't believe some of the colors! Either I use it or toss it. 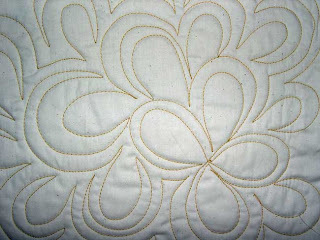 Today, it would be nice to invite a few quilting friends over and see what we could make out of this. 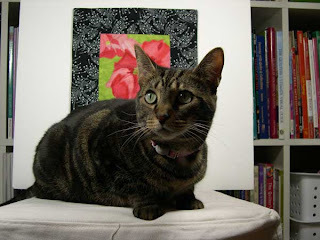 But my quilting buddies live too far away. 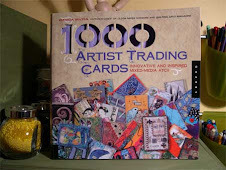 So, I will print out my 40% off coupon for the local scrap book store and go shopping. : ) When you are undecided, just shop. I did it! One of my goals was to add a personal banner to my blog. My "Pods I" piece contained some of my favorite colors, so I used it as the background. If anyone has trouble with it loading, let me know. I tried to keep the pixels small. I know it could probably use a few tweaks, but hey, it's up there and hopefully it won't fall down! (corny : ) So, this is my creative venture for today! I would appreciate any comments or hints if you have any. I also managed to hem curtains today and add more for privacy to my family room. This is the beginning of a series. 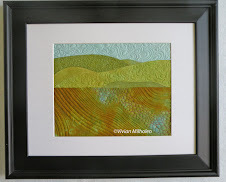 This piece is machine pieced, machine appliqued and quilted. 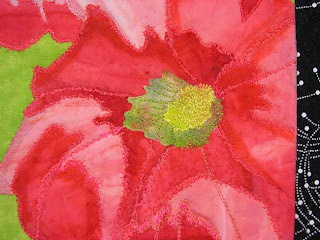 Most of the fabric is my own hand dyes and there is also some commercial fabric used. Trying to photograph this quilt made me realize I have to do something about better lighting. I took it outside to take the pictures this morning, but it was too chilly to spend too much time out there. I have several sketches I drew this past fall which I hope to include in the series. After visiting the Smithsonian galleries, my creative mind is humming wildly. Shapes and textures abound in the museums. Little Emma had her "necessary" surgery this last weekend, so I have been sitting with her trying to keep her quiet as much as possible. 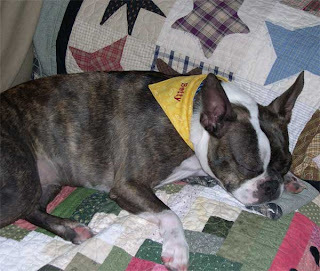 But that is not easy to do with a very active Boston Terrier. She is recovering nicely and is asleep in her little bed as I type this. I got a new little desk for Christmas and it is so wonderful! Here is a picture of it. I needed a place just for writing, sketching and designing. Now, everything is within reach. 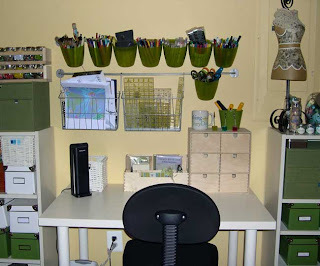 My colored pencils, pens, scissors, rulers are all above the desk in the hanging containers. I confiscated the set of drawers on the desk from my husband's office. They fit perfectly on my desk. Most everything here is from IKEA! The beads in the spice jars are in wooden spice racks from IKEA. So inexpensive! OK, off to creative again! I have been busy creating for the past few days and failed to post my work. 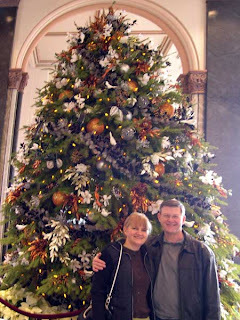 First, I will add a few pics of our wonderful holiday with our kids here in DC. On Christmas Eve, we hopped on the metro and did a walking tour of DC. I have loads of pics but will only show a few here. We all had such a wonderful time together. I think it was the best Christmas ever! We toured the Smithsonian museums, galleries and the decorated White House (well, outside the gate, of course). 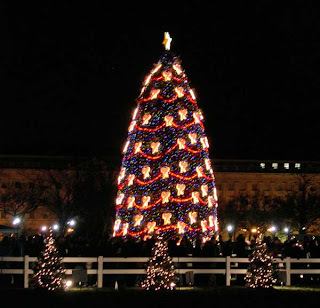 After dinner downtown, we went to see the National tree. I think we all thought, wow, big hair, big bows! I will say it wasn't the prettiest tree I have seen. Those new big red bows (lights) by GE were sort of gaudy. I would have chosen nice, white lights. How about solar powered? Let's save energy. On New years Day, we went to Georgetown. 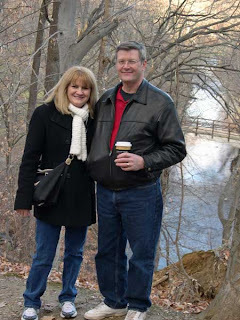 We decided to hike the unimproved trail in Deer Creek Park. How beautiful it is! It is amazing that it is in the middle of town. My New Year's resolution is printed on a mug that I found in a shop in Georgetown (DC area). 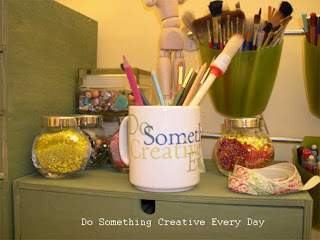 "Do Something Creative Every Day" will be my motto this year. We have had a wonderful visit with our children. They fly back to California today and we will miss them terribly. I will have to light the fire on my creative muse and follow my new motto. I have several challenges to start and some to finish. We did so many things and explored DC this holiday season. So, I have lots of pictures to post later...But on to my bit of creativity I managed to squeeze in on New Year's Eve. Below is a picture of our grand dog, Betty. I made this little scarf for her. It has Velcro on it so it is easy to remove and she seems to really like it. 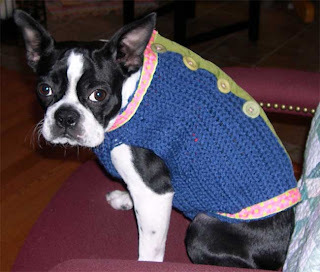 Our creative daughter designed and made this dog sweater. Emma is modeling it here. We may start a new business designing doggy wear together. One of my resolutions is to post pictures of my artwork everyday. After all, I will "Do something creative everyday".